I thought I’d seen (and unfortunately, smelled) everything at my local gym. I’ve encountered 40something men in stinky fraternity t-shirts so thin and frayed you could read fine print through them, and women in get-ups so outrageously revealing I expected to see dollar bills sticking out of their oh-so-low waistbands. But today I observed something that sent me running to Google immediately after my workout: a personal trainer wearing a bright green Morphsuit. I didn’t recall ever seeing a Morphsuit before, except on members of Blue Man Group. I knew the name only because it was printed in large letters across the trainer’s derrière. I assumed it must, in some way, promote more efficient burning of calories. But why did it need to cover her hands… and at times, her entire head? Prepare to be amazed! Morphsuits provide no discernable athletic benefit. They are intended to produce nothing more than attention for the person wearing them. (Mission Accomplished!) That’s great if you are on stage at the Venetian in Vegas… but maybe not ideal if you are standing next to your client, who is paying $100/hour for the privilege of grunting and sweating her way through TRX training while you watch. You’ll be relieved to know that you can “breathe, see and even drink through” Morphsuits, which explains how the Equinox trainer could wear one, and still pounce like a drill sergeant whenever her client appeared to be slacking during her workout. The suits come in plain colors, and patterns such a camouflage and tie-dye. For Morphmen and Morphwomen who need to carry cash or a Muni pass, fanny packs are also available. There are flag Morphsuits (Alba gu brath, Scotland Forever! ), and even a black tuxedo Morphsuit. Wait, hang on. It’s all coming back to me. 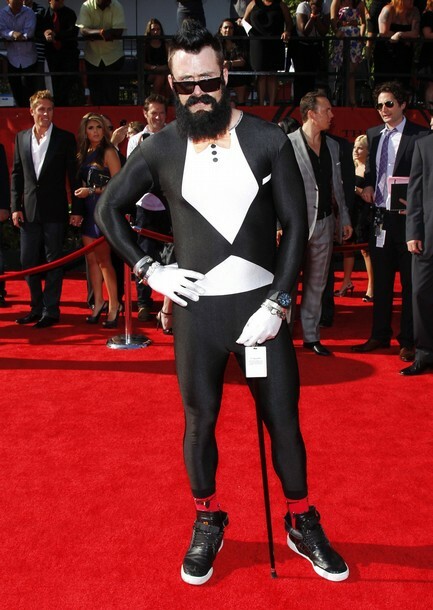 I HAVE seen a Morphsuit before… on Brian Wilson at last year’s ESPYs! The fact that I haven’t run across a one since July suggests that, even with B-Weezy owning the look, Morphsuits have failed to set the world on fire (despite being synthetic and highly flammable). Still intrigued? You can consult the handy Morphsuit FAQs online. They address such burning concerns as how a wearer might zip/unzip the suit without assistance, and how to respond when someone asks to have his/her photo taken with you, while you are Morphed. I hope the Equinox trainer takes her cue from Brian Wilson, and makes today’s Morphsuit experiment her last. She’s in great shape, but the suits are unforgiving to say the least. Unless you are a 6’2”, 200 pound closer with legs like redwood trunks, buns of steel and an arm like a cannon… a 100% Lycra body stocking with words across your backside is not a good look for you. At least 2 fans per basketball game (in the student section) had these suits on @ the Ole Miss games this season. The suits were half blue half red (a vertical split down the middle), and likely provided by the Ole Miss athletic marketing dept (I hope the same 2 guys always wore the suits. You really couldn’t tell because of the full hood/ mask. Ewwwww. ) Anyway, the grossest was when one of the guys got to go in the “catch as much money as you can booth in 30 sec” during a tv time out, replete with a little utility belt strapped on to store the money while attempting to catch more. Mind you this was the fraternity kid who is drinking beer nightly and has the gut to show it. Nasty. The trainer was so weird, when she pulled it up over her head and was sort of in her clients face giving her instruction. I would have been like, get that stupid thing off or I’m finding a new trainer.